After an impressive showing in January, President Barack Obama's job approval ratings in February continued to climb, but at a slower rate. Obama seems to have topped off for now, in other words. Overall, the month averaged better than January, but Obama's numbers softened noticeably at the end of the month, and could turn flat or even slightly downward in March. The overwhelming political story all month long was the Republicans tilting at a big legislative windmill. Spoiler alert: the windmill was always going to win. But that didn't stop the Republicans from mounting up and crashing headfirst into it, of course. The whole battle was a set piece from the get-go, which in this case was back in December when the "cromnibus" budget was passed. Republicans demanded the right to challenge President Obama's new immigration policy by attempting to hold the funding for the Department of Homeland Security hostage. Except, in this case (and to stretch the analogy), nobody ever believed they'd ever shoot that particular hostage. It was an empty threat. That was bad enough, but what made things even worse for the Republicans are the mathematically-challenged among them who refused to face the reality that having 54 votes in the Senate does not equate to "a veto-proof majority." Indeed, no matter how many times you add up 54, it does not come out to be 67. It just doesn't. By month's end, House Republicans had embarrassed John Boehner once again by refusing to pass his "Plan B" bill. It was up to the Senate to save them, with a last-minute one-week extension. Today, the clean Senate funding bill cleared the House, so it looks like the wholly-manufactured crisis won't spill over into March much. There were other minor political stories in February, from a judge in Alabama "standing in the courthouse door" over marriage equality, to the annual conservative-fest that is CPAC (where we learned that Donald Trump is teasing us all with a possible White House run, once again). Brian Williams, the anchor of NBC's broadcast news program, crashed and burned his reputation as well, but none of these minor diversions cast much shadow on the president's ratings. For the month, Obama wound up with a monthly average job approval rating of 45.4 percent, and a monthly average disapproval rating of 50.1 percent. Approval was up 0.6 percent over last month, and disapproval fell 0.4 percent. Obama continues to regain ground he's lost since the summer of 2014, but at a much slower pace than in January (where, for comparison, his approval jumped 2.4 percent and his disapproval fell 2.3 percent). Obama's "underwater" number (disapproval minus approval) also continued falling, from 5.7 percent to 4.7 percent -- down from its peak of 12.0 percent last September. 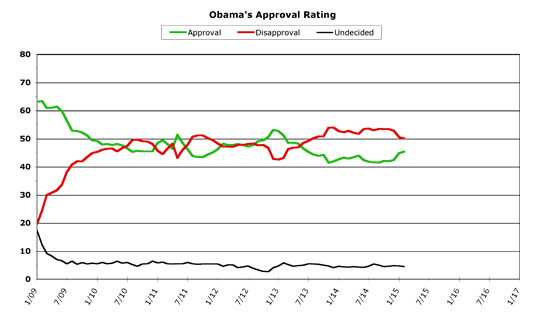 All in all, February was a solid month for Obama, although there were slightly worrisome signs at the end of the month. Obama regularly has troubles in his public opinion polling during the summers, but he also usually has a pretty good fall and winter. This year is no exception. From a low in September, Obama's monthly approval average has gained a total of 3.9 percent while his disapproval has fallen 3.4 percent. That's an impressive turnaround from the doldrums he had been experiencing since the summer of 2013. Obama's monthly averages almost succeeded in passing a milestone in February, that of being above 45 percent approval and below 50 percent disapproval. That's much better territory to be in than the 40-45 percent approval range and 50-55 percent disapproval range, where Obama had been mired for all of 2014. But while February showed decent gains in the monthly numbers, the daily averages showed a different trend. 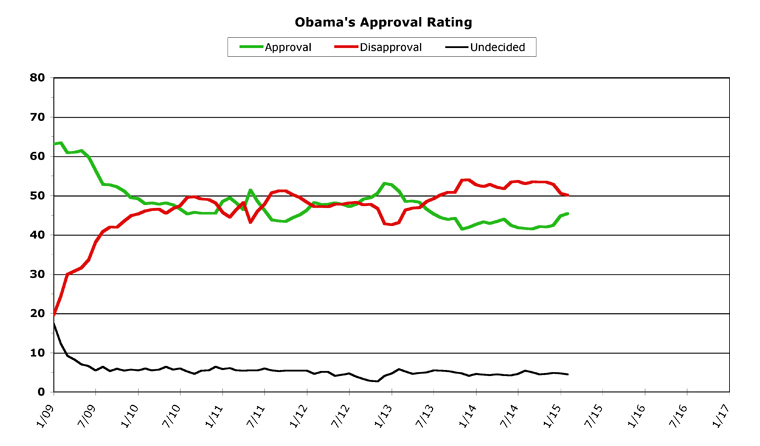 To put it plainly, the safe bet for March would be that Obama's numbers flatten out or perhaps even dip slightly. Even this isn't terrible news, because it would represent a consolidation of Obama's January boost. If he can hold steady in March and flatten out, it would mean that the big rise at the start of the year wasn't a temporary "State Of The Union" bump, but instead represents a growing acceptance by the public. In the daily averages, Obama started the month at his strongest point and finished up at his weakest point. His daily approval was 46.2 percent the first day of February, but this represented the absolute peak of his January rise. From that point, Obama's daily approval average slipped back but held steady throughout most of February, and then spiked downward briefly (to 44.1 percent) on the day before the month ended (he ended February by recovering some of this, charting 44.6 percent). His daily disapproval numbers followed a similar course throughout the month. Obviously, both daily numbers heading into March are roughly a percentage point worse than Obama's monthly averages. Which is why his numbers are likely to flatten out in March, or possibly fall a fraction of a point. Most of the contentious politics are already out of the way for March, with Netanyahu's speech to Congress today and the end of the D.H.S. budget standoff. But Obama's total victory over the congressional Republicans in the immigration fight probably won't resonate with the public that much. The only other serious political issue on the calendar (of which I am aware, at least) would be if John Kerry struck the outlines of a deal with Iran over their nuclear program. That would be contentious, so it remains to be seen whether the public would applaud such an achievement or not. If it happens, it will likely happen at the end of the month, so that may influence April's numbers more than March's. While I've been pretty optimistic over the past few months in trying to predict the trends of Obama's approval rating, this month I don't see much in the way of good news for Obama in March. The safest bet is that his numbers will hover right around where they are now, perhaps losing a few tenths or even gaining a few. January was a big spike, February was the easing off of the trend, and March looks to see it flattening out. As I said, even this isn't exactly horrible for Obama, because his numbers seem to be coalescing around a point far above where they were for the past year and a half. That's a pretty decent consolidation, all in all. As long as his numbers don't suddenly tank, he's in a better position with the public than during all of 2014 and half of 2013. Good enough, for now. "They'll blow it in the play-offs You'll see. They'll blow it in the play-offs!" But, spring training was pretty darn good. Short, but good.